Don’t let the title fool you. It’s all going to be okay. Yes, I do have a weird thirst for using the letter “x” in my descriptive verbage. And yes, I’m about to reach farther for this comparison than Skip Bayless does for his own high school accolades: It’s only because LeBron is the X-Factor in tonight’s game! Hah! And it has nothing to do with his notorious disappearing acts at his teams’ most critical junctures in previous playoff appearances. Instead, I’m going to talk a traditional mechanism employed by millions of housewives, girlfriends, fair weather and apathetic sports fans everywhere. I’m talking about rooting for the “underdog,” also known as the team that isn’t favored by Vegas odds makers or “just seem like good guys” or are playing the Yankees. Don’t get me wrong – I’m a sucker for a good underdog story. I have a hard time rooting against the small market Rays in baseball, and George Mason’s 2009 Final Four run nearly brought me to my knees. And there is a certain allure to being labeled an “underdog,” that may actually spark a swell of confidence and self-belief and ultimately lead to a better game performance, possibly even an upset victory. But fact is, most teams who are favored to lose, well…lose. My question is for all you LeBron haters out there. He is the epitome of a Goliath in this little David versus Goliath dream world you conjure up in every way imaginable. But when so many root against him, doesn’t that completely, paradoxically, oxymoronically (I like this word so much that I made it up, raised it as my own, and will use it freely. Thank you.) turn the tables? Doesn’t this make LeBron the underdog? If it’s cliché to root for Goliath, but fully acceptable to root for the opponent who has been beaten, battered and bruised by hardship, can’t it go both ways? That is, if LeBron is Goliath but falls into the beaten (has yet to win a title), battered (has shouldered the largest responsibility for both teams he’s been on) and bruised (absolutely destroyed by fans for The Decision to move to Miami) categories, isn’t he essentially David? Told ya it would be complex. Normally the story would end with David slaying Goliath. Yay! Everyone lives happily ever after, the last page of the story book depicts a sunny, rainbow and dolphin-filled picture almost as vomit-worthy as this, and little Jimmy goes to bed with a smile on his face (Apologies to any readers named Jimmy. It was the first name that came to mind.). But when Goliath has been slain every time, and fans of David turn nasty (somebody get this kid spell check!) and grow in number at every one of the top dog’s failings – when do we start to feel bad for the big guy? And when it seems like nobody outside of Miami and a random spattering of a few fans are actually pulling for the Heat to win and King James to finally earn his crown, that puts all odds against him to succeed. Maybe not statistically. But I’ll bet you a majority of people in America who know what a basketball is and have heard of this LeBron fella are rooting for him to crumble again. And while you’re sitting smugly thinking about the prospects of telling everyone how you’re pulling for the underdog again, the joke is actually on you. 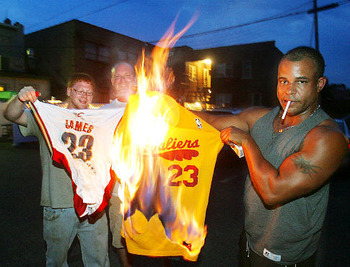 You’ve been so busy gloating and reveling in LeBron’s failures, that your own pungent hatred of the guy has blinded you. 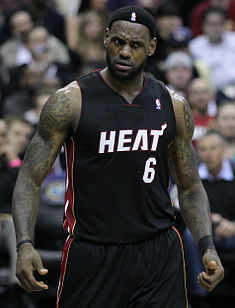 It’s not cool to root against LeBron anymore. He is the underdog. Nobody believes in LeBron. Nobody roots for LeBron. Nobody likes LeBron. Except for the few of us who are hoping the real underdog pulls this one off. The underdog who happens to be the best, richest most talented player in the pack. What an exceptionally complex, paradoxical sports oxymoron that turns out to be. Follow Jeremy on Twitter @Jamblinman. Comment below if you beg to differ! This entry was posted on June 9, 2012 at 3:01 pm and is filed under Sports. You can follow any responses to this entry through the RSS 2.0 feed. You can leave a response, or trackback from your own site.